First lady Michelle Obama hosted the stars and director of the new film "Hidden Figures" at the White House on Thursday, encouraging women and girls to take inspiration from a decades-old story of achievement in the face of discrimination and sexism that, despite the progress of the past half-century, not entirely relegated to the past. Reflecting on the waning days of her husband's administration, the first lady used the opportunity to offer her own spin on American exceptionalism, as demonstrated by the film's dramatization of the true story of three African-American women working at NASA whose math skills helped launch the first manned American spaceflight. "What we saw in this film is that when we pull together men and women, people of every background and color and faith, immigrants who've come here from across the globe to make America their home – when we bring all of that brainpower to the table, anything is possible, even going to the moon, right?" she said. "That is how America won the space race in the 1960s and, as I said, that approach is just as important today." 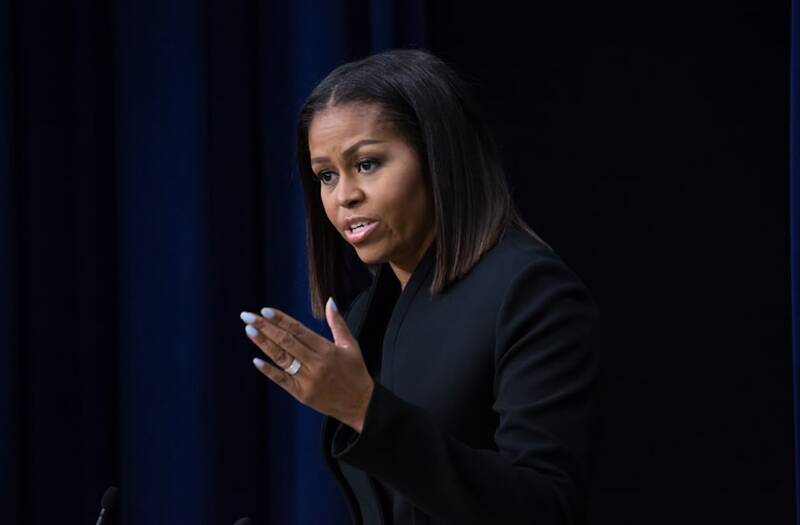 The first lady's comments, in the light of the incoming Trump administration, were a plea for private partners and nonprofit groups to continue press forward on efforts launched by the Obama administration to focus on the lifting marginalized groups, in particular the White House Council on Women and Girls, established shortly after Barack Obama took office in 2009. The morning following the film screening, at a less star-studded event at the Executive Office Building next to the White House, the council released its third annual report – "Advancing Equity for Women and Girls of Color" – detailing the unique challenges women and girls of color face in school and in the workforce, part of a targeted effort to address the structural disadvantages that keep them persistently behind their white and male peers. The report, and the multi-year initiative, focused on five objectives: reducing teen pregnancy; encouraging success in school; making science, technology, engineering and math – or STEM – education more inclusive; opening avenues to economic prosperity; and reducing the risk factors for vulnerable girls. "We have made significant progress across these five objectives ... but are aware that there is still work to that needs to happen in the years to come to strengthen the voices and capacities of women and girls of color and their peers," the report said. Amid the lists of programs launched and grant funds disbursed was the recognition that the obstacles facing women and girls of color remain stubbornly in place. Students of color remain targeted at significantly higher rates for discipline and punishments meted out are often harsher. Compared to their white peers, data collected by the Department of Education's Office of Civil Rights, black boys were three times as likely as the overall student population to be suspended during the 2013-2014 school year. Black girls were five times as likely as white girls to receive out-of-school suspensions. "The data show clear racial disparities in school discipline; while 6 percent of all K-12 students received one or more out-of-school suspensions, the percent is 18 percent for black boys; 10 percent for black girls," the report notes. African-American girls make up more than half of girls suspended in preschool, even though they comprise less than half the female preschool enrollment. Such uneven treatment has a cascading effect as girls get older. The National Center for Juvenile Justice notes that girls are "disproportionately affected and more likely to be held in placement ... than boys" for misdemeanors and other non-serious offenses, including running away from law enforcement, often signalling abuse or trauma. These girls are more often "treated as offenders, rather than girls in need of support, perpetuating a vicious cycle that is increasingly known as the 'sexual abuse to prison pipeline,'" the council report says. Teenage pregnancy among girls of color, while falling, is still twice as high as the national rate, according to the Centers for Disease Control, with significant negative effects on their lifetime earning potential. "When teens delay birth, the average family income of their offspring increases – and the longer a teen birth is delayed, the larger the average family income of the offspring," the report says, citing research by the Brookings Institution. "The combination of delaying births and increasing education creates the most significant gains in the child's own income." Meanwhile, persistent gaps in access to STEM training preclude girls and women of color from "access to high skilled, high demand careers, which provide a route for the middle-class to attain STEM jobs," the report notes. The Obama administration has encouraged increased STEM learning, including $1 billion in private funding to make those programs more accessible to low income and diverse communities. Once they do reach the working age, women of color are far more likely than their white and male peers to face unemployment and for longer periods of time. They are also more likely to be employed in the service sector, and make up two-thirds of workers paid at or below the federal minimum wage. While Congress has remained resistant to increasing the federal minimum wage or requiring paid sick and family leave, the Obama signed an executive order mandating paid sick leave for federal contractors. The rule, which takes effect on the first of the year, "gives additional paid sick leave to 1.15 million people working on federal contracts, including nearly 600,000 employees who do not currently have even a single day or paid sick leave." And in March, the administration met a two-decade old goal of granting at least 5 percent of federal contract dollars to women-owned small businesses. Many of the council's objectives have been buttressed by private investments and public-private partnerships, with millions of dollars of continuing commitments made by outside organizations to continue past the end of Obama's terms in office. "With commitments from foundations, non-profit organizations and research institutions across the country, we are confident that the work to appropriately consider the challenges and persistent opportunity gaps faced by too many disadvantaged, marginalized, or underrepresented girls will continue," the report concludes.